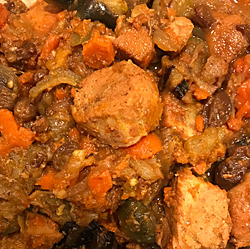 Comments: This was the first time we tried this recipe and we used a coated iron dutch oven instead of the Slow Cooker or Crock-Pot specified in the recipe. We also substituted raisins for the cranberries, but next time will use the cranberries. This is also the first time we had the Reverdy Cuvee Ortus Sancerre and didn’t realize it would drink more like a Chardonnay than a Sauvignon Blanc. In the end the tastes and textures of both the food and wine went together perfectly and it turned into a memorable wine pairing dinner.